Prednisolone Acetate is used to treat common eye infections in dogs and cats, including mycobacterial or fungal infections. This product may also be used in eyes to aid the post-surgery healing process. Prednisolone Acetate is a corticosteroid, which means that among other things, it regulates inflammation which will help your pet's eye(s) heal, as well as ease your pet's comfort during the healing process. If overused, Prednisolone Acetate can have negative effects on your pet’s vision. Do not use Prednisolone Acetate if your pet has a bacterial, viral or fungal infection without also using proper anti-infective treatment. Tell your veterinarian if your pet is pregnant or lactating before giving them Prednisolone Acetate. Be sure to adhere closely to veterinarian prescription amounts. This medication isn’t typically prescribed for more than 10 days at a time. Inactives: boric acid; edetate disodium; hypromellose; polysorbate 80; purified water; sodium bisulfite; sodium chloride; and sodium citrate. 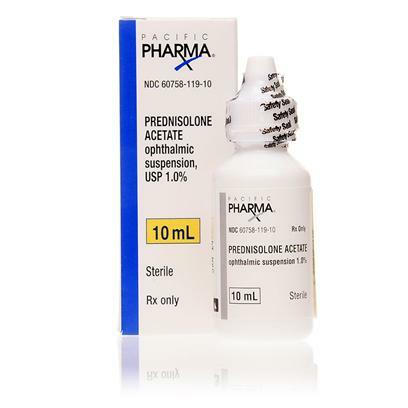 Prednisolone Acetate is available by prescription only and must be administered directly into a pet’s eye through a tapered nozzle tip. The veterinarian who prescribes the solution should dictate dosage; typical dosages may involve administering drops up to every hour or two until symptoms subside. With clean hands, gently cradle your pet’s face, and encourage their face toward the ceiling. Using the control-drip nozzle, drip the recommended dosage into the affected eye(s). Point the tip of the dropper away from your dog’s eye in case he jerks his head. For the first few minutes after administering the medication, don’t allow your pet to rub her face or wipe the drops out.